When you look around the world, there are so many things that can be used to your advantage in the advertising industry. When marketing your brands, it's important to notice the new trends that are taking place! What are the different types of Inflatable Furniture? Right from stools to couches, from chairs to sofas. We have a diverse range of custom printed inflatable furniture which will keep you sitting pretty much anywhere. Inflatable Couch: Its sleek design makes it eye-catching with a high-quality look and feel. Inflatable L Chair: It is one of our most requested items & can withstand much heavier usage and is extremely durable. Inflatable Lounger: There is nothing quite like sitting back and relaxing on your own personal lounge chair, specially designed for your company! Inflatable Ottoman: This product flies off of our product lines because of the fully dye sublimated prints and it's natural versatility of use. 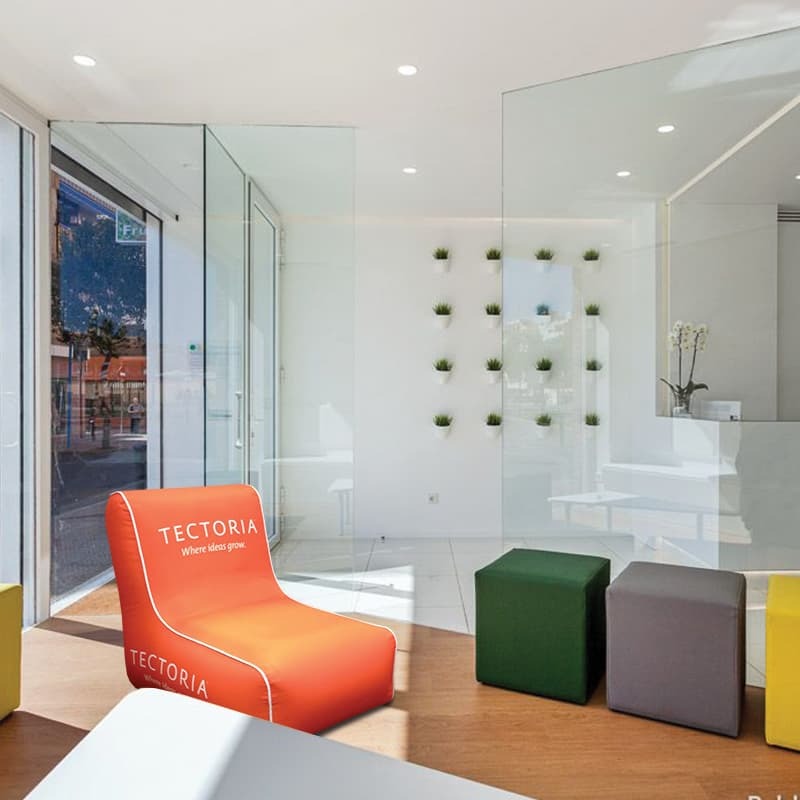 Inflatable Rocker: Highlight of this product is all its characteristics of an inflatable with a wonderfully high-end feel and unique customized designs. Inflatable Stool: This product is a great way to infuse some fun and enjoyment into your daily activities and interaction with customers. 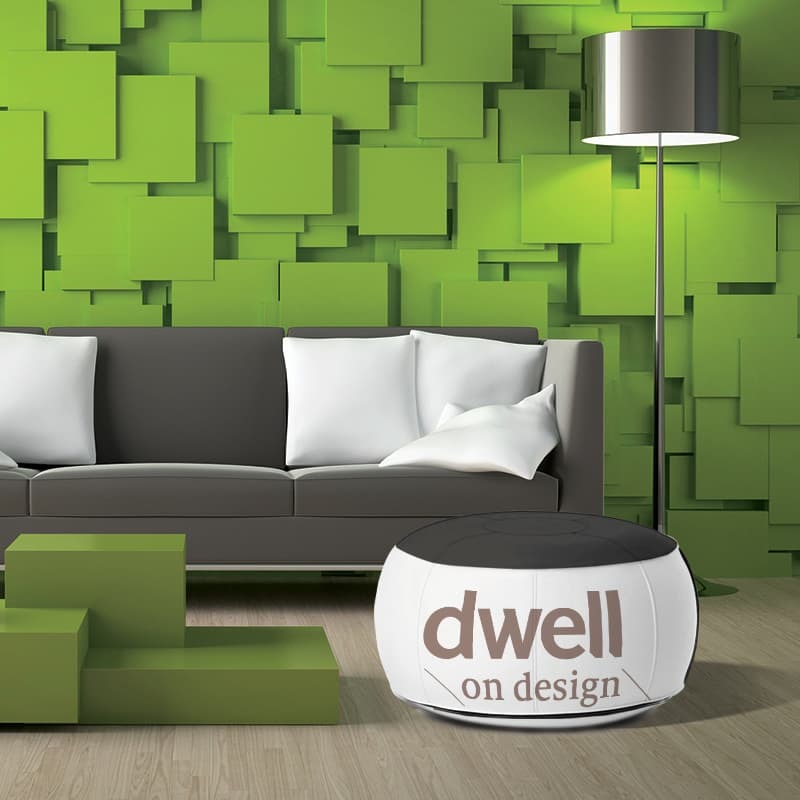 Design-Aire™ inflatable furniture is one of our favorite innovations and trends! 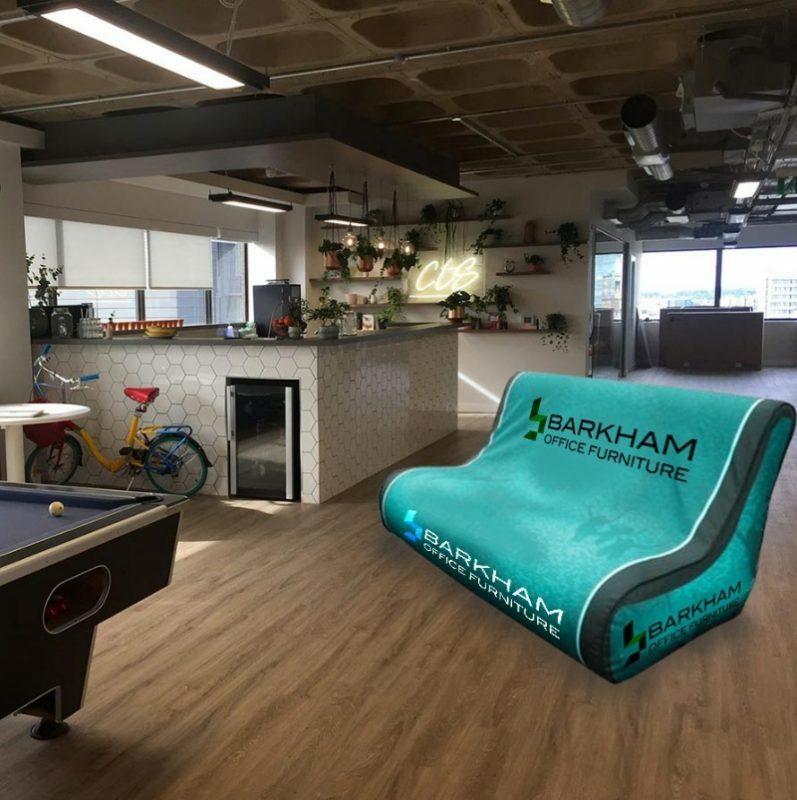 We took regular inflatable furniture and made it more durable, fashionable and simply a must have for any showroom, brand and or activation. The Design-Aire™ Couch is truly one of a kind! Its sleek design makes it eye-catching with a high-quality look and feel. It's made from our EP material inner inflatable structure and then covered with a high-end premium polyester fabric shell which is printed using high-quality digital dye sublimation. This material we use makes this product durable, easy to transport, wash and repair if necessary. The print is completely customizable; we can accommodate nearly any design wanted! The Design-Aire™ Lounger - There is nothing quite like sitting back and relaxing on your own personal lounge chair, specially designed for your company! This material is also made of Elasto-Planolium™ with an outer canvas shell. This makes the lounger an incredibly durable and dependable item! This is offered in full Dye Sub, and the print is completely customizable! The Design-Aire™ L-Shaped Chair is one of our most requested items! The Design Air product line, unlike conventional PVC inflatables, can withstand much heavier usage and is extremely durable. Not only is this product well build, but it's also so easy to set up! It inflates quickly with an air pump and the seal ensures that no air escapes while you are using it. Once you are done using this item, simply release the air via the seal, and it folds up tight for clean and easy storage even when space is limited! The Design-Aire™ Ottoman is one of our simplest designs, but that's no lack for design! This product flies off of our product lines because of the fully dye sublimated prints and it's natural versatility of use. This piece too is completely customizable! This product is also made out of Elasto-Planolium ™ with an outer canvas shell, so it's very durable and easy to work with. It's no wonder why these inflatable furniture for adults and kids are becoming the latest trend. They work well in practically any environment. They can be used as everything from ad space at events, in-store, at festivals and so much more! The sky is the limit with these amazing products!